Last week saw an important anniversary. I’m sure you are all thinking of July 4th, a date that is very important to many people because it is the anniversary of the birth of The Clash, who played their first live gig on 4th July 1976. For the older generation, of course, it is remembered for another reason: the end of food rationing in the UK on 4th July 1954. And it’s also, as the British Embassy in Washington so kindly reminded us all on the day, the 150th anniversary of the publication of Alice in Wonderland and should therefore be celebrated in all literate nations. But for me, there is a much more important and personal anniversary. Here is the front page of the Swindon Evening Advertiser from 4th July 1995, the day I finally made the front page of my home town newspaper. The front page news? That Swindon had become forever embedded in the history of the technology of money. 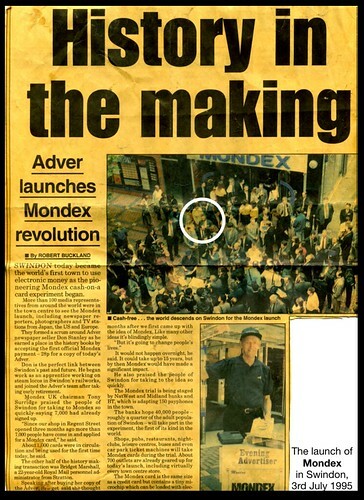 I was there on 3rd July 1995 in Swindon town centre when Evening Advertiser vendor Mr. Don Stanley (then 72) made the first ever live Mondex sale. And here is the photographic evidence of same — in case you don’t happen to have copy of that Swindon Evening Advertiser — as I emerge Zelig-style from the crowd to watch Don take the cash. It was a very exciting day because by the time this launch came, we at Consult Hyperion had been working on the project for some years (and for the first three or four years it was entirely in secret). I went along on the twentieth anniversary, hoping to find a plaque marking the spot or a smart card embedded in the pavement for something. What I actually found was… nothing. 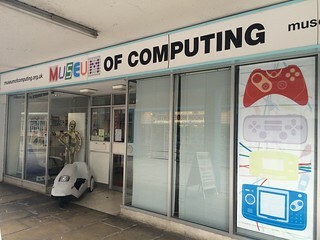 This brought a tear to my eye as my home town’s special place in the history of financial service technology appears to have been wiped from the collective memory. So for those of you who don’t remember what all of the fuss was about: Mondex was an electronic purse, a pre-paid payment instrument based on a tamper-resistant chip. This chip could be integrated into all sorts of things, one of them being a smart card for consumers. Somewhat ahead of its time, Mondex was a peer-to-peer proposition. The value was transferred directly from one chip to another with no intermediary and therefore no cost. In other words, people could pay each other without going through a third party and without paying a charge. It was true cash replacement. The Mondex Card was invented at National Westminster Bank (NatWest) in 1990 by Tim Jones and Graham Higgins. In December 1993, (NatWest) launched Mondex, then called a “smartcard” as a form of electronic cash based the technology they developed. The next series of Mondex cards were issued in a joint development pilot with Midland Bank (part of HSBC) also in the UK and British Telecom (BT) in Swindon (a town of around 300,000 people, approximately 70 miles west of London.) . Swindon had been chosen as, essentially, the most average place in Britain. Since I’d grown up there, I was rather excited about this, and while my colleagues carried out important work for Mondex (e.g., risk analysis, specification for secure transfer, multi-application OS design and such like) I watched as the fever grew out in the West Country. When the day came, there was pretty good geographic coverage. The shops needed special POS terminals and they also need special “unlock” terminals, so it was quite a hassle for them. The cards could be locked using a four digit pass code, something that customers had requested in focus group discussions. But the only way to lock the cards was using the hardware electronic wallets and the phones that few customers had. Therefore all of the shops that accepted Mondex had to be fitted with a lock/unlock device. As it turned out, customers never bothered locking their cards and never used the lock or unlock stations, but it was the fact that the lock existed and that the lock/unlock stations were visible that gave them confidence in the system. 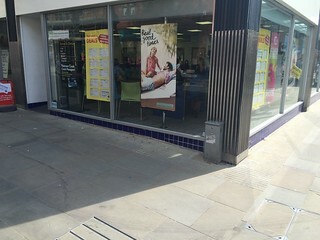 More than 700 of Swindon’s 1,000 retailers adopted Mondex: an impressive tally. Shopkeepers and publicans loved it as they didn’t have to mess around with change or cart sack-loads of coins to the bank. But the public, by and large, weren’t buying it. 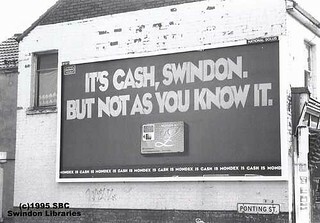 Swindon never became anything like a cashless society. That’s an interesting comment. Many of the retailers were quite enthusiastic because there was no transaction charge and for some of them the costs of cash handling and management were high. I can remember talking to a hairdresser who was keen to get rid of cash because it was dirty and she had to keep washing her hands, a baker who was worried about staff “shrinkage” and so on. The retailers were OK about it. It just never worked for consumers. It was pain to get hold of – I can remember the first time I walked into a bank to get a card. I wandered in with 50 quid and had expected to wander out with a card with 50 quid loaded onto it but it didn’t work like that. I had to set up an account and fill out some forms and then wait for the card to be posted to me. Most normal people couldn’t be bothered to do any of this so ultimately only around 14,000 cards were issued. I also pulled a few strings to get my mum and dad one of the special Mondex telephones so that they could load their card from home instead of having to go to an ATM like everyone else. British Telecom had made some special fixed line handsets with a smart card slot inside and you could ring the bank to upload or download money onto your card. I love these and thought they were the future! My parents loved it. The main reason why they loved it was nothing to do with Mondex: it was because, in those pre-smartphone days, it was a way of seeing your account balance without having to go to the bank or an ATM or phone the branch. You could put the Mondex into the phone and press a button and hey presto your account balance would be displayed on the phone. This was amazing two decades ago. For the poor sods who didn’t have one of those phones (essentially, all Mondex card users) the way that you loaded your card was to go to an ATM. Now, the banks involved in the project had chosen an especially crazy way to implement the ATM interface. Remember, you have to have a bank account in order to have one of these cards and so that meant that you also had an ATM card. So if you wanted to load money onto your Mondex card, you had to go to the ATM with your ATM card and put your ATM card in and enter your pin and then select “Mondex value” or whatever the menu said and then you had to put in your Mondex card. Most people couldn’t be bothered. If you go to an ATM with your ATM card then you might as well get cash, which is what they did. In September of 1995, twelve Mondex ticket machines were installed in 6 car parks. Four months later, card readers were installed in 80 metropolitan buses that, in May 1996, offered reduced fares for Mondex users. It is possible that I’m not remembering this absolutely accurately, but I do remember these are the two places where the hassle of getting the electronic value outweighed the hassle of using cash. 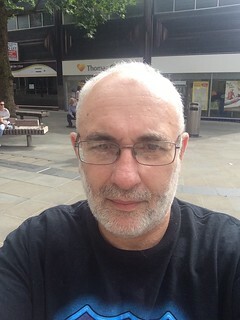 My dad really liked using the card in the town centre car park instead of having to fiddle about looking for change but it often didn’t work and he would call me to complain (and then I would call Tim Jones to complain!). I remember talking to Tim about this some years later and he made a very good point which was that in retrospect it would have been better to go for what he called “branded ubiquity” rather than go for geographic coverage. In other words it would have been better to have made sure that all of the car parks took Mondex or make sure that all of the buses took it or whatever. Sadly, the car parks still take cash (and when I pulled in to park, I didn’t have any, so I had to leave the car and go to shop to get change and then come back to car). 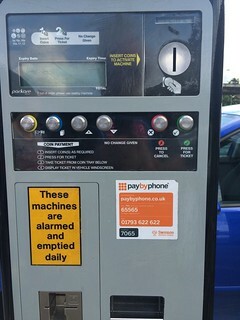 Note that the machine doesn’t take cards: the mobile phone has become the key cash alternative. More on this later. 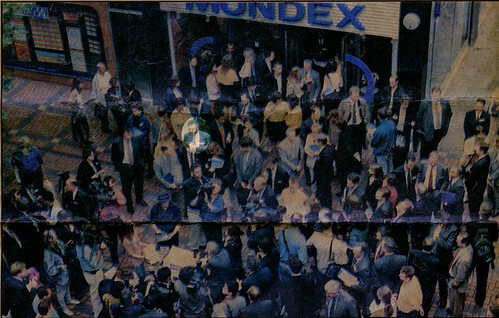 Meanwhile not only did the car parking machine still take cash, and not only had Mondex vanished without trace, but I couldn’t find anyone else gathered in the square to celebrate this remarkable episode in Swindon’s history. I turned a began a disconsolate nostaliga-fuelled stroll around The Brunel Centre. I can remember when this opened in 1973, a cathedral dedicated to modernity that represented the transformation of provincial life. A shopping mall! Watching real bands at The Brunel Rooms! And that is where I made the amazing discovery that to this day Swindon remains a place where retailer-led experiment in the payment systems of the future is ignored by the general population. I saw this with my own eyes. 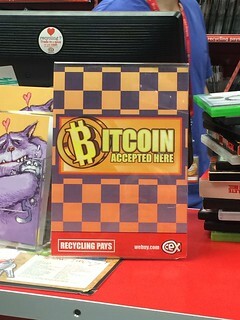 First, I was genuinely shocked to discover a shop advertising that they take Bitcoin! I couldn’t resist it. Bitcoin wallet to the ready on my iPhone, I picked up an item of merchandise and approached the check out. I asked the guy if they did indeed take Bitcoin as advertised. He confirmed that they did. I asked him if anyone had ever paid with Bitcoin before and he said that they had not. So I waved my phone and attempted to claim their Bitcoin cherry. Unfortunately, no-one could remember the password to their Bitcoin wallet. They went off to get the manager, but he couldn’t remember either. So I paid with a MasterCard. It appears that neither Bitcoin nor Mondex have turned the heads of the moonrakers to the extent that they might provide a viable cash replacement option in popular retail outlets. So Mondex didn’t take a chunk out of cash. It’s still around. “The death of cash has been greatly exaggerated,” the British Retail Consortium said only this week, reporting on their latest figures. Consumers used 4.5 per cent less cash on high street and supermarket shopping in 2014 than they did the year before, while the number of transactions using cash dropped by 0.9 per cent to 52 per cent. At the time of the Mondex launch, cash accounted for more than two-thirds of retail transactions. Now it’s half. There is progress, but it’s not because of electronic purses. So what are the lessons that Bitcoin and its descendants can draw from a study of the Swindon experiment? I guess there are three things that I think about it looking back with perfect hindsight. The first lesson is that banks are very probably the wrong people to launch this kind of initiative. Our experiences with (for example) M-PESA, suggest that a lot of the things that I remember that I was baffled and confused by at the time come down to the fact that it was a bank making decisions about how to roll out a new product. The decision not to embrace mobile and Internet franchises, the decision about the ATM implementation, the stuff about the geographic licensing and so on. I can remember when the publicans of Exeter asked the banks to install Mondex terminals in the pubs since all of the students had cards and the bank refused on the grounds that the University’s electronic purse was only for use on campus. Normal companies don’t think like this. In retrospect, it seems clear to me that one of the key problems with these “ahead of their time” cash-replacement products was, oddly, that they were produced by banks. There were many people who came to the scheme with innovative ideas and new applications – retailers who wanted to issue their own Mondex cards, groups who wanted to buy pre-loaded disposable cards and so on. They were all turned away. I remember going to a couple of meetings with groups of charities who wanted to put “Swindon Money” on the card, something that I was very enthusiastic about. But the banks were not interested. The second lesson is that the calculations about transaction costs (which is what I spent a fair bit of my time doing) actually really didn’t matter: they had no impact on the decision to deploy or not to deploy in any particular application. I remember spending ages poring over calculations to prove that the cost of paying for satellite TV subscriptions would be vastly less using a prepaid Mondex solution rather than building a subscription management and billing platform and nobody cared. I went to present the findings to a bank that was actually funding satellite TV roll out at the time, BT who were providing the backhaul and the satellite TV provider. Nobody cared. The guys at the bank told me that they didn’t have the bandwidth for it (which meant, I think, that they had no interest in spending money so that another part of the bank might benefit). The banks with big acquiring operations were being asked to compete against themselves and they didn’t care either. The transaction cost, which I thought was the most important factor, really wasn’t one of the drivers. Back in 1995, I was wrong about the imminent arrival of stored-value smart cards in the mass market. I was just as wrong as the director of the US Mint, but for a completely different reason. I had simply made a calculation that told me that the cheapest way to move money around was over a ubiquitous and inexpensive digital network was using tamper-resistant chips at each end of the transaction to secure the system. Now we know, of course, that those tamper-resistant chips will be in mobile handsets and that they will be nothing to do with the banks (or, for that matter, the mobile operators either). We were right about the architecture and the need to anchor digital money in physical security, but wrong about who the builders would be. The third lesson is that while the solution was technically brilliant it was too isolated. The world was moving to the Internet and mobile phones and to online in general and Mondex was trying to build something that was optimised not to use of any of those. At the time of the roll-out, I had an assignment for the strategy department of the bank to provide technical input to a study on the future of retail banking that one of the big management consultancies was working on. I remember being surprised that it didn’t mention the Internet, or mobile phones or (and here’s something that I thought would be big!) digital TV. Most of their work as far I as could see was on redesigning the furniture in the branches. Mondex was designed to be the lowest-cost peer-to-peer offline electronic cash system at exactly the moment that the concept of “offline” began to fade. It was not alone in failing to react to this fundamental change. it’s an interesting point to consider with hindsight: why did we make systems such as Danmont, Mondex, VisaCash and use them to compete with cash in the physical world rather than use them in the virtual world where there was no cash? This was clear to me very early on in the experiment. This isn’t hindsight: I drew the same lesson from the Mondex pilots in Canada and the USA as well. The banks put Mondex terminals in places where they already had card terminals that worked perfectly well. you could use Mondex cards in Swindon in the places that acquired bank-issued payment cards (eg, supermarkets) but not in places where digital cash had a real competitive advantage: on the Internet, in vending machines and at the corner newsagents. Mondex, one of the early stored-value cards, launched by British banks in 1994, is still the best tool for creating virtual cash. Now, at the same time that all this was going on at Mondex, we were working for mobile operators who had started to look at payments as a potential business. These were mobile operators who already had a tamper-resistant smart card in the hands of millions of people and so the idea of adding an electronic purse was being investigated. Unfortunately, there was no way to start that ball rolling. you couldn’t just put Mondex purses into the SIMs, you had to get a bank to issue them. And none of them would: I expect they were waiting see whether this mobile phone thing would catch on or not. Look at how it’s gone trying to get banks to use operator SIMs for NFC. Mondex didn’t begin to experiment with the Internet for another year and even then it was severely hampered by the lack of standards for online commerce and payments. I can remember many happy hours around the table with a variety of organisations working on what became “Internet Opening Trading Protocol” (IOTP) in an attempt to get something going here, but it never took off. And besides, there were already alternatives up and running (DigiCash went live a year before Mondex). In a fragmenting market, which now had Visa and MasterCard backing different horses, the proposition started to disintegrate. So, for a variety of reasons, Mondex never caught on. It never got even half of the 40,000 hoped-for users in Swindon and usage remained low. And two decades on the contactless debit card and the mobile phone (and in a week or so the combination of the two in Apple Pay) continue to displace cash, we still don’t have a mass market cash alternative on the web (yes, I know, Bitcoin, whatever) and prepaid card propositions, while still expensive (because they use the existing debit rails), are widespread. A decade from now strong authentication, privacy propositions, push payments and immediate settlement networks will achieve what Mondex set out to do and reduce cash to rump payment mechanism (down to perhaps a third of transactions by volume and a tenth by value) and made person-to-person electronic payments safe and simple. On 3rd July 1995, I thought I was witnessing the dawn of the new era of financial services. In actual fact, that happened a month later with the Netscape IPO on 9th August 1995. Thanks for making me feel old, Dave! A great perspective. I’ve always been amazed at how few lessons were learned from the failure of both Mondex and then Visa Cash to take off, although we all know corporate memories are short. Mostly I think they failed because of the normal payment problem – that issuing is easy but acceptance is hard. It was particularly hard for smartcard schemes in the late 90s because there wasn’t even Chip & Pin out there and so everything was mag stripe. Where Mondex was most successful was in the Universities, especially Exeter where it ran for 4-5 years, as every single student and member of staff had a card and they could be used everywhere on campus – for payment in bars, shops, vending machines, photocopiers, payphones, etc. could be loaded at the ATM and BT payphones and even acted as the ID card, NUS card, library card and even building access. As you say, it’s a shame those closed user groups weren’t expanded into their nearby towns. For me though, contactless debit/credit has now achieved the goals we had for electronic cash, and that has (a) taken a long time to build both issuance and acceptance and (b) tweaked the existing products, technology and user experience rather than have to invent a brand new, technical elegant way of exactly replicating the features of cash.